Nephrology Dept, AZ Sint-Lucas, Gent. Valerie Neirynck qualified as a MD in 2006 at the Catholic University of Leuven, Belgium, and then fulfilled her specialty training in internal medicine and nephrology in 2012 at the same University. 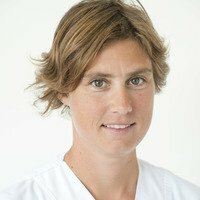 During her 6 years of training, she was based two years in Antwerp where she found interest in Intensive Care medicine at the academic hospital Stuivenberg with Dr Manu Malbrain. After 2 years at the University hospital of Leuven, she then took a challenge in the KIWI model of health with one year of training in New Zealand . During the year abroad, she gained a lot of experience with peritoneal dialysis and home dialysis and she also experienced a wide range of health and organizational aspects of medicine and nephrology in a different country. She fulfilled her final year of her training in Leuven and in August 2012 she obtained her degree as nephrologist in Belgium. Before starting at the AZ St Lucas at Ghent, she worked another year as a nephrologist in the South of France near Toulon (Hyères AVODD) where she was privileged to gain more experience in home dialysis. During that year, she also specialized in vascular access for dialysis. In Montpellier with Prof Dr J -Y Bosc, she had a training in evaluation and monitoring of vascular access both by clinical examination and by the use of ultrasound. Finally an intensive course of renal ultrasound in Preston, completed her skills and capabilities to efficient use of ultrasound in daily renal clinical practice and dialysis. Besides her clinical career, she also graduated in the field of Hospital and Health Care Management at the Catholic University of Leuven. Her final script for graduation consisted of ‘Advantages of the Lean- thinking model within organization of daily dialysis practice’. Course in French, preferably for dialysis nurses.